Ed Pemberton, Doctoral Researcher at SPERI has been named runner-up in the 2018/19 Bennett Prospect Public Policy Prize. His essay submission to the prize can be read here. By many measures, the UK is one of the richest countries ever to have existed. However, for many people, it may not feel much like that is the case. Whilst our GDP per capita puts us in the top-tier of rich countries, understanding the distribution of this is crucial. The UK experiences significant spatial inequalities, and many regions have missed out from the benefits of economic growth. Whilst London maintains its status as one of the most important centres of the global economy, many areas have been left to languish in its shadow. With much of the country experiencing standards of living more on a par with countries that are less well-off at the aggregate, Britain’s self-conception as a ‘rich nation’ depends very much on where it looks. Addressing the problems of regions that have experienced periods of decline and neglect requires us to refocus the very way we look at the national economy. When a statistic such as GDP per capita can paint an outwardly rosy picture, whilst masking a great deal of economic inequality, we need to ask whether it remains fit for purpose. The policy I set out here proposes a relatively simply transformation of this central economic statistic, that may provide a better picture of the ‘national’ character of economic growth. But before setting out in detail how this new regionally adjusted GDP statistic might work, it’s necessary to explore what it means to describe a place as being ‘left behind’ and the processes that can cause it. Whilst this is not limited to any particular national context, the UK stands as a stark example and as such provides a valuable case study to frame the discussion. So how do places become ‘left behind’? The constant churn of technological change, the depletion of natural resources or the increasing scale of industrial production can all mean that places lose touch with the economic purpose they grew up to meet. But once a city or town has found its place and formed a history, it becomes difficult for that to be unwound. Left entirely to the market, a lack of economic opportunity can drive people away through poverty or even starvation, something that is rarely acceptable for a modern state. Instead, redistribution can keep these places ticking over, extending enough resources to meet the state’s responsibilities to its citizens, but rarely enough to generate dynamic local economies. But this form of economic limbo is proving to be politically unacceptable. The ‘left behind’ regions provided significant support for recent democratic reversals to the established political-economic order. Votes for both Brexit and Trump represented a throw of the dice to break a cycle that had left too many regional economies in stasis. Of course, redistribution as a form of economic life-support is not the whole story. There have been numerous policy efforts to restart regional economies and provide the framework for the people living there to realise their potential and make a greater contribution to the economic life of the nation. However, in the UK at least, such efforts have had limited success. An ideological commitment to the free market restricts too much direct fiscal intervention. Instead, supply side policies and institutional reforms have been favoured, but at the heart of this lies a contradiction. Relying on market-driven solutions to help areas that have ultimately been left behind by the market may always struggle to drastically reshape economic fortunes. What might more directed regional policy look like in a modern economy? It needn’t mean throwing back to a past of state-backed industries and direct productive investment. Investing in the infrastructure, services and skills to improve the conditions for greater external investment can help to broaden economic possibilities. The state has always invested in such things, but the distribution of such investment is dictated by a logic that mirrors the underlying economic structure. The search for ‘value-for-money’ in public investment means that the direction of scarce fiscal resources is too frequently determined by the potential for the highest returns. As I will argue, for a country such as the UK, there are significant structural reasons as to why sticking too rigidly to this logic will continue to help thriving regions at the expense of those that need it most. It is only by changing the way we think about our economy and baking this in to the way the state makes its decisions about the distribution of resources, that these policies will succeed. Before setting out a new statistic which could do just that, it’s important to demonstrate how the pursuit of growth at all costs leads to a specific economic geography. The emerging world economy is transforming the relationship between state and economy, and both policy makers and social scientists are struggling to get to grips with these changes. 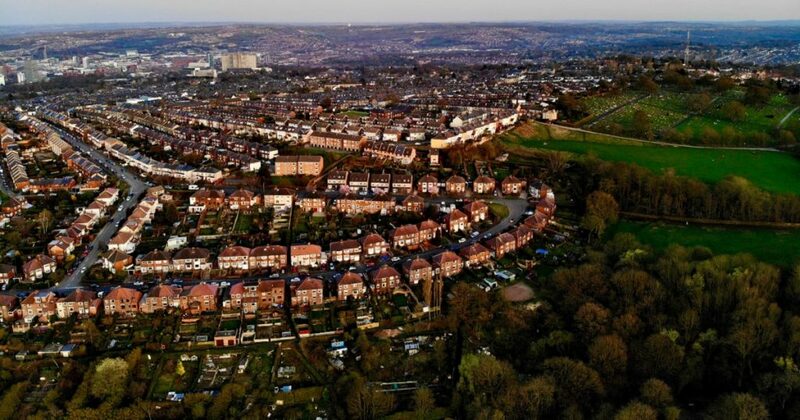 Whilst economy is not destiny, the UK has found itself pursuing an economic model that has left it particularly vulnerable to the forms of regional inequality described here. Breaking this path-dependency means reformulating how we measure and evaluate economic success. Without this the country risks doubling down on the policies that meant it reached this point in the first place. There are two ways in which the opening up of the global economy has driven regional inequality in countries like the UK. The first is deindustrialisation, as the physical production of goods has been moved overseas in search of cheaper labour. As production has been moved overseas, the need for the management of firms to locate themselves alongside spatially extensive production facilities has diminished. The second is related, but distinct. Companies that offshored production, but retained control, were now freed from the shackles of their large production facilities. They no longer needed to be located close to expanses of cheap land and willing labour. Businesses that oversee and direct global value chains are now able to concentrate in well-connected global cities and take advantage of the profound network effects that come from clustering such activity. The nature of global value chains is that most of the value is captured within technical, highly-skilled processes at their start and end. From initial research and development, to branding and sales, the generation of value through economic enterprise has come to follow a ‘Smile Curve’, with production itself attracting relatively meagre rewards. These roles predominantly involved high-waged, high-skilled labour and benefit enormously from the network effects that are possible from concentration in large cities. They support large numbers of tertiary business services and financial firms, which themselves replicate these dynamics of concentration. In the case of a large financial centre such as London, the banks and brokers that provide services for worldwide businesses and high net worth individuals are particularly adept at capturing value created across the world economy. The wealth that these businesses can capture from global economic processes is then recirculated around the local and national economy. These multiplier effects are not evenly spread – the secondary economic benefit of the City of London is much more obvious amongst the high-end retailers and booming property market of the capital than in the more diffuse forms of redistribution that flow outwards across the rest of the country. But despite its distributional implications, promoting the concentration of high-skilled labour in globally connected cities remains the primary strategy of governments around the world. The riches on offer from capturing these high value sectors of the supply chain outweigh the alternative of reshoring production processes as a whole. Meanwhile, encouraging businesses to move to less well-connected regions, without the critical mass necessary for positive network effects, risks forgoing significant productivity gains. As long as this remains the case, states face a choice between growing the overall size of the pie or seeing a smaller pie distributed more fairly. The consensus has overwhelmingly been for the former, albeit frequently accompanied by attempts to redistribute after the fact. But these attempts at redistribution merely keep people and places ticking over, extending enough resources to meet the state’s responsibilities to its citizens, but failing to recreate a sense of economic purpose. In order to go beyond post-hoc redistribution and ensure a more equal distribution of value-generating economic activity in the first instance, its necessary to turn away from a well-entrenched emphasis on maximising economic output. Policy makers attempting to move away from this guiding principle of economic management face a problem. The imperative to secure growth and achieve ‘value-for-money’ has been incorporated in the very structures of bureaucratic decision making. This is expressed through institutional tools like the UK Treasury’s ‘Green Book’, whereby all UK government departments are required to demonstrate that their implementation of policy is better for the bottom line than potential alternatives. Although capacity exists to take account of intangible measurements of value, these calculations are frequently limited to their economic dimensions, given the edge over more speculative concerns by the availability of easily quantifiable data. In turn, this biases policy towards interventions that support the cities and urban agglomerations best placed to extract value from the complex networks of the global economy. Without a fundamental change to the central principles by which decisions about the economy are made, the state risks working against itself in its attempts to revive its left behind regions. This is no longer even necessarily a conscious choice of policymakers, but something weaved into the very fabric of the nation’s decision-making toolkit. At the heart of this is the way that economic activity is frequently reduced to a single number, that does little to distinguish between the form or location of that activity. The flaws and faults of Gross Domestic Product have been well-explored, and it is not my intention to relitigate this here. For all its shortcomings, the GDP of a nation remains the single best indicator of the volume of taxable economic activity and will remain a central priority of government for the foreseeable future. My proposal will not drastically reformulate how we calculate the value but instead provide a simple modifier that can adjust any potential growth in economic activity with respect to its distribution. The figure, which I am calling ‘regionally-adjusted domestic product’ (RADP), would be constructed through a relatively simple calculation. This would take top level aggregated economic figures used to calculate growth and weight it by a GINI coefficient calculated from the gross value-added figures at the NUTS2 regional level. 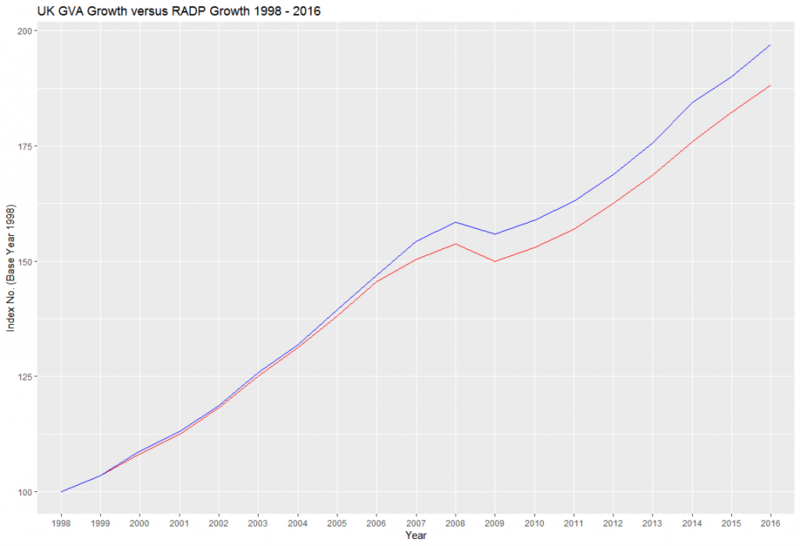 In the data discussed in this section, Gross Value-Added figures taken from the ONS website are used, but GDP could also be used. The figure could be calculated either for the whole economy or on a per person basis, as appropriate. This provides a modifier based upon the specific geographical distribution of economic activity, that can deflate any growth that occurs in one part of the country at the expense of another. Tracing this number over time in a UK context (fig. 1) shows how the last 15 years of growth have come at the expense of growing regional inequality, particularly around the financial crisis of 2007-08. The number this calculation produces is dimensionless and not meaningful when viewed in isolation. It can’t replace the important role that GDP plays in enumerating the precise amount of taxable economic activity. However when it comes to evaluating policy choices, if the government has a genuine commitment to help reduce regional inequality, it could ensure that one hand of government is not working against the other. By using a new lens to guide decision making, different outcomes may emerge. A policy that grows the London economy, whilst doing little to help the rest of the country, might give the greatest absolute benefit to growth, but weighting it by its regional impact may transform the calculations sufficiently that an alternative would be considered. To provide a practical example, one of the largest capital projects in the country’s history, High Speed 2, is currently travelling through the torturous bureaucratic process to becoming a reality. This project has been run through extensive cost-benefit analyses, leading to the conclusion that the best way to help regional economies in the UK is to better connect them to the capital. This may well be true, from the perspective of total output, but it may not help much with its distribution. Whilst some other metropolitan centres may benefit from increased connectivity to London, it fails to move the country away from an economic model that sees London as the hub of value-generating activity. Areas that were left behind may continue to struggle to catch up with the rest of the country. How might the decision have been different if a focus on regional distribution had been captured in the heart of the numbers used for analysis. The same investment distributed across more localised regional transport programmes may have had a less sizable overall impact, but if its contribution in rebalancing the national economy was formally accounted for, then perhaps it would have stood a better chance of becoming a reality. A number alone, without the will to use it, is of little use. This change won’t revolutionise the practice of a government uninterested in tackling regional inequality. But any political effort to do that will face challenges from the structural position of the UK in the global economy and from entrenched institutional assumptions about the role of public policy. Whilst these both exist, any individual policy that aims to help the areas left behind will find itself fighting a tide of others doing the opposite. Ensuring that the state has the capacity to help left behind areas means fundamentally reformulating the way in which the state sees itself, providing a new lens able to focus on the spatial form of economic development. The statistic I propose here sets out to do just that. It can challenge ingrained assumptions about what matters in the economy, how it should be managed and in whose interests. Providing a metric that encourages policy makers to focus not only on the total volume of value generating activity in a country, but also its distribution, breaks long-entrenched assumptions about growth first and redistribution later. By ensuring value generation itself is evenly spread, there exists greater opportunity to genuinely transform the experience of economic life for people living in left behind regions. This may mean accepting trade-offs about the total amount of economic value being generated which are frequently hard to rationalise in the context of the modern policy process. But by providing a simple and clear statistic that can present these choices in a different light, better decisions may be made.